Unzip the kaleidoscope file into this folder. Find the My plugin folder and it will appear on the plugin menu. Use the magic wand to remove the background from the flower. Next select - Bitmaps - Mehdi - Kaleidoscope. Move the sliders on the menu to get the effect you want. 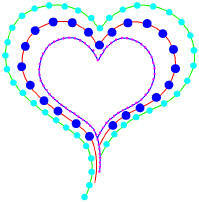 You can now use this as a template for your lace designs. You can use the kaleidoscope images to make some interesting Lace Images. The Lessons also includes cutting out areas of your images and the use of Zoner Draw to make background images to use with the Crystal Clear Transfer Paper.